Mas Merolla, at an altitude of 1120 m above sea level , is surrounded by mountains and landscapers of natural interest, close to the villages of Gombrén and Pobla de Lillet, where you can enjoy splendid views of the Catllaràs hills and Pedraforca. 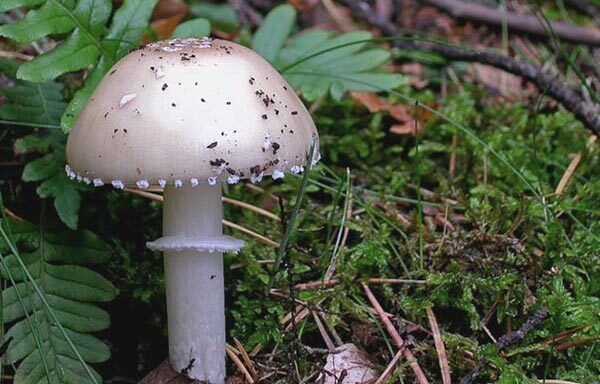 Enjoy the natural setting and nearby woodland, including wild mushrooms, deer and wild boar which can be found around the house. In September, be sure not to miss the Berrea del ciervo (Roaring of red deer during the mating season) – it is unforgettable! This is simply to say that it is exactly as described in the ad. The house is perfect, spacious and well equipped, and the property and surroundings are insuperable, with wonderful views and of course, complete silence. It’s a marvellous place and the owners are very attentive. In summary, it’s the perfect place in which to spend a few days. Our group consisted of two families with children, and we really enjoyed the surroundings, the outings and the house. Apart from the comments I’ve already made, I would add that they let you have all the firewood you want and you can regulate the heating directly. Not like other houses, in which the owners are often "stingy" in this respect, and you have to wrap up to keep warm inside the house. An incredible weekend at Mas Merolla. The house was very well kept and tastefully decorated, and was equipped with all the necessary fixtures. Every part of the building was perfect. 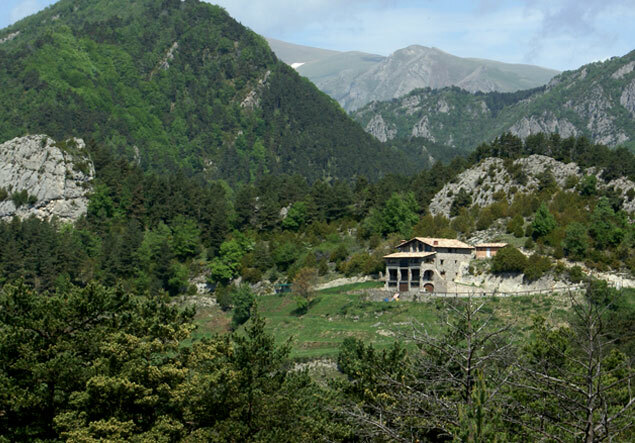 The location of the house, set in the spectacular Catalan Pyrenees. We were a group of two families with children, and we really enjoyed our stay. We will certainly be back!!! The owner provided us with exquisite service. We were all delighted with Mas Merolla and its common areas, terrace, garden, mountain scenery, peace and quiet, the friendliness of the owners, the furniture and absolutely everything about it. We would certainly recommend it! We organised a small wedding reception in the house in July and we plan to go back and spend a weekend there in the winter with some friends, to see the snow on the mountains. We were a group of six adults and six children. It was incredible, pure relaxation, peace and quiet. Open spaces, in the heart of nature. The house is spectacular and the setting, idyllic. The children had a whale of a time, especially with the dog, "Perdut", and they had the opportunity to see deer, horses, cows and foxes. They played in the meadows while we adults enjoyed the sun and the barbecues on the property. A truly magnificent house in the high Pyrenees. We were there for a night, but all eight of us who stayed there thought it was really impressive. We were extremely comfortable, amidst a unique setting and with marvellous views for those of us who enjoy mountain scenery. We can’t wait to return. Welcome to Mas Merolla, a pretty, recently-refurbished Catalonian country house, situated in the heart of a wonderful mountain landscape, surrounded by woodland and pasture. The house lies 200 meters drom the GI-402 road, running from Gombrèn to Pobla de Lillet. 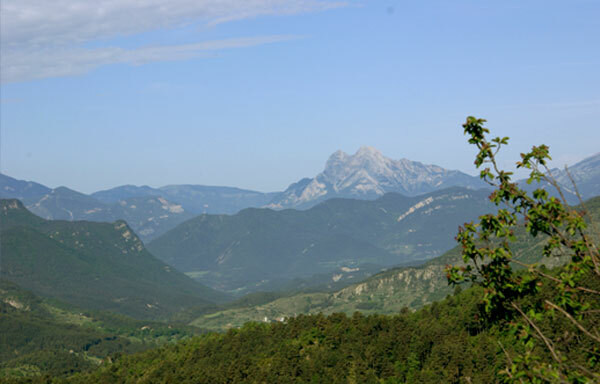 Its altitude of 1120 m above sea level provides incredible views over the area, dominated by the emblematic Pedraforca mountain.